How one young agrarian is betting on a home-grown solution to poverty and malnutrition. 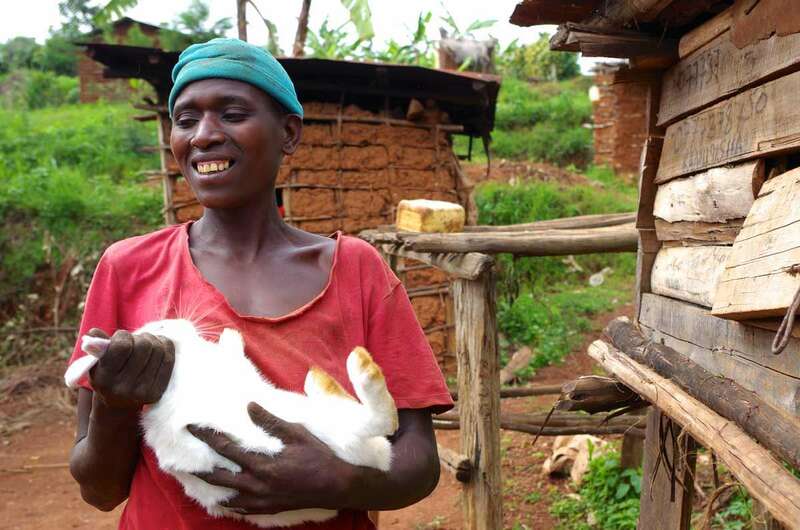 Lilian is a farmer raising rabbits in the village of Kicumbi. Rabbits are an ideal solution to preventing child malnutrition in Uganda, where it's estimated that 45 percent of children under five experience forms of malnutrition, including severe protein deficiency. The Gates Foundation funds research on engineering new genetically modified-varieties of staple crops – including rice, sweet potatoes, and bananas – to contain higher amounts of vitamins and nutrients. Many development organizations, including the Alliance for Green Revolution in Africa, distribute what they call “improved seeds,” or hybrid and genetically modified seeds, with promises of higher yields and financial returns for poor farmers. But the solutions to child malnutrition aren’t always dependent on money, GMOs, or Western expertise, argues Alphonse Twinamatsiko, a farmer and sustainable agriculture technician from southwestern Uganda. Twinamatsiko works as a consultant for various community-based organizations, including Go Organic Africa. “We have everything we already need to address malnutrition,” he says. Rather than importing ideas from Western countries, Twinamatsiko is looking no further than his own backyard where a simple wooden cage, built for less than $50, houses one male and two female rabbits. 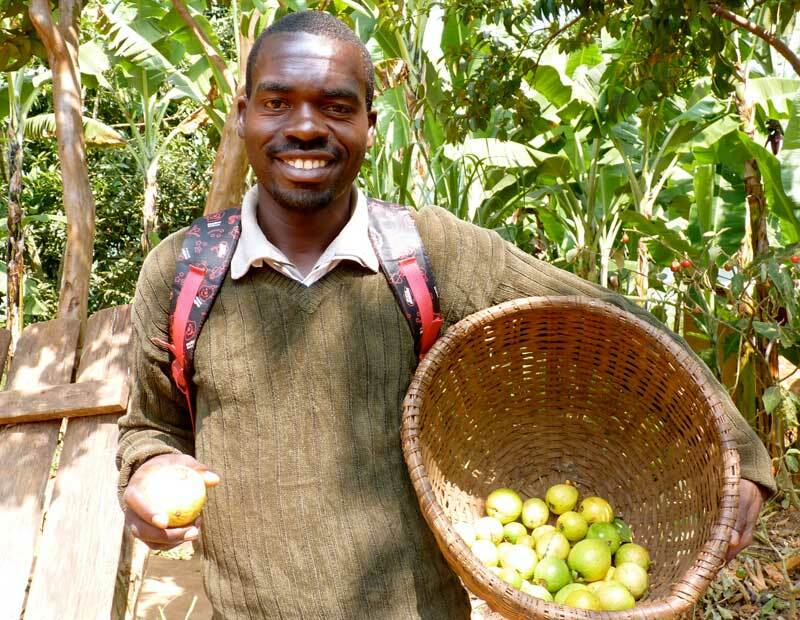 The 29-year-old was born and raised in the Kabale District in southwestern Uganda where more than 60 percent of the population practices small-scale agriculture. Farmers grow indigenous varieties of sorghum, sweet potatoes, cowpeas, beans, and maize. While many also raise goats and chickens, livestock is rarely eaten, but rather reserved as a sort of “living bank account” and sold to pay for school fees, land, and medical emergencies. As a result of this carbohydrate-heavy diet, UNICEF estimates that 45 percent of children under five years old in Kabale are experiencing forms of malnutrition. One of the most common kinds is kwashiorkor, an energy-protein deficiency caused by the lack of protein, iron, and vitamin B12. Kwashiorkor can lead to stunted growth and development, and the World Health Organization estimates malnutrition is the underlying cause of 45 percent of all child deaths, worldwide. In 2012, Alphonse Twinamatsiko graduated from Baraka College in Kenya, studying sustainable agriculture and rural development. It was in Kenya where he first saw rabbit-breeding projects on a larger scale, and then brought the technology back home to Kabale, Uganda. Rabbits are more efficient than chickens or goats, as farmers use locally available weeds and vegetation to feed them, versus relying on expensive grain feeds in the market. Farmers in Kabale argue that, on a small scale, rabbits are less prone to diseases or mortality than chickens. In 2012, Twinamatsiko completed a diploma in sustainable agriculture and rural development at Baraka Agricultural College in Molo, Kenya. While there, he learned about intensive rabbit breeding. Although Twinamatsiko raised the animals recreationally as a child, he never considered it a serious venture. At Baraka College, however, he had the opportunity to visit household and larger-scale rabbit breeding projects and learn about their benefits. Inspired by his experiences, Twinamatsiko returned to southwestern Uganda with the goal to promote rabbit breeding. There’s a good reason for the expression “breed like rabbits.” One doe can give birth to four to six litters every year, producing upwards of 60 offspring. That’s a huge return for poor farmers who rarely eat meat. Rabbits are an ideal meat-source for poor farmers in Kabale for a variety of reasons, Twinamatsiko argues. The majority of farmers can’t afford to buy grain feed in the market to raise chickens, nor do they have enough land to graze cattle. 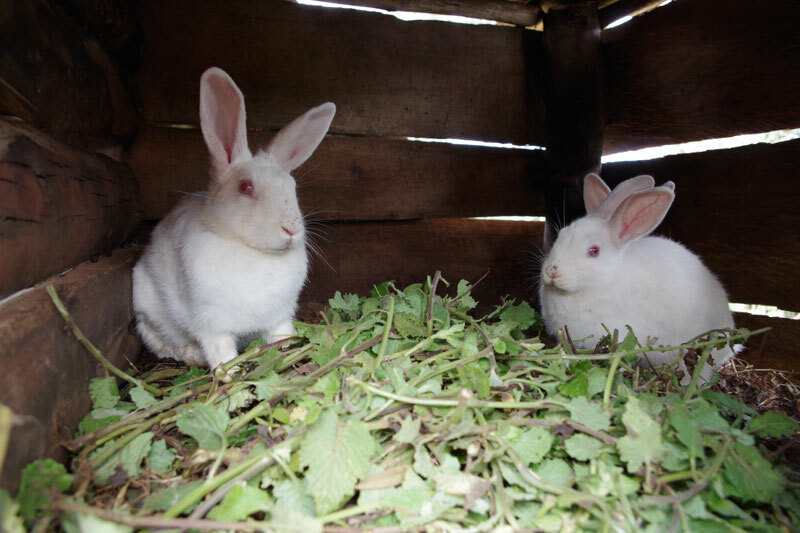 Instead, rabbits can be fed on weeds and wild vegetation, which are locally available and affordable to farmers. Secondly, disease vulnerability and mortality rates are lower in rabbits than chickens, especially when they’re kept in elevated cages. And finally, there’s a good reason for the expression “breed like rabbits.” Twinamatsiko says that one doe can give birth to four to six litters every year, producing upwards of 60 offspring. That’s a huge return for poor farmers who rarely eat meat. In 2013, Twinamatsiko teamed up with a local medical doctor, Dr. Anguyo Geoffrey, who runs a community healthcare organization called the Kigezi Healthcare Foundation (KIHEFO). Dr. Anguyo regularly identifies cases of extreme malnutrition in southwestern Uganda. He admits sick children and their caretakers for rehabilitation treatment at KIHEFO’s clinic in Kabale. Together, Twinamatsiko and KIHEFO began developing a rabbit-breeding program with the goal to supply rabbit stock to poor farmers with vulnerable children. In May 2015, KIHEFO built a Rabbit Breeding Center in Kabale, and Twinamatsiko rolled up his sleeves and got to work in the community. Twinamatsiko (left) and Atayo Benson display a new sign at KIHEFO’s Rabbit Breeding Centre in Kyanamira, Kabale, in southwestern Uganda. 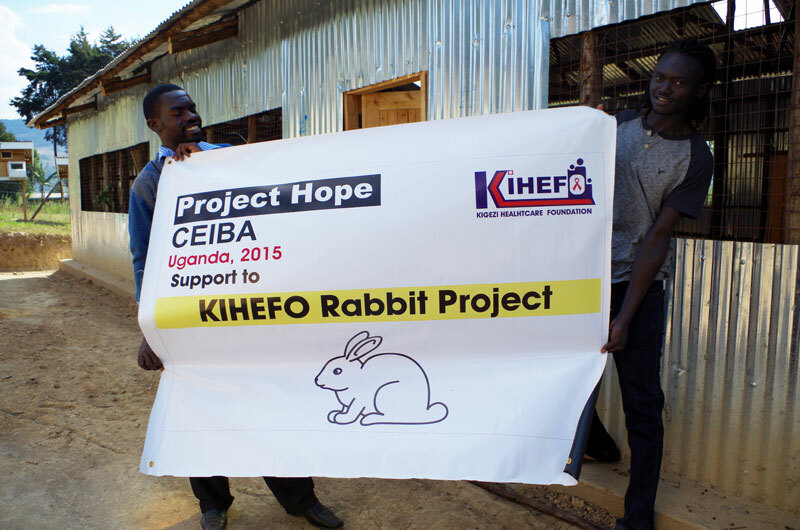 KIHEFO’s project is breeding rabbits on large-scale to distribute free to poor farmers in need of a helping hand up. KIHEFO provides rabbits and training to help farmers start their own projects and work to alleviating forms of malnutrition and poverty. 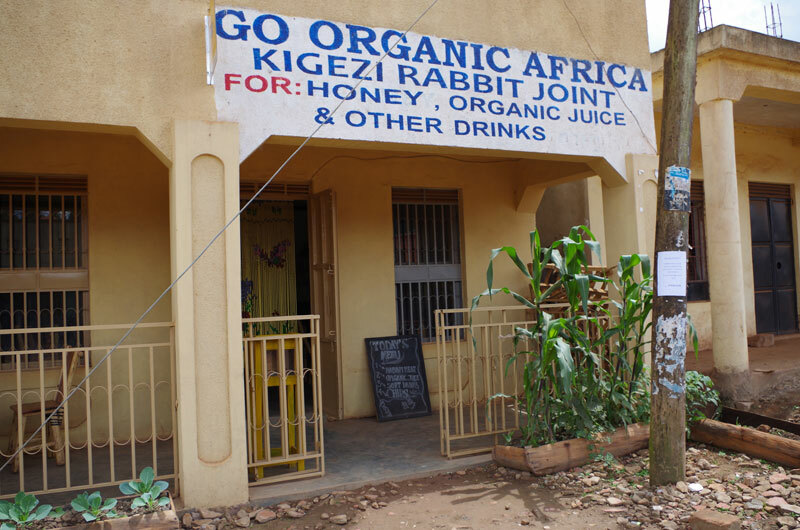 Last year, Twinamatsiko and his colleagues at Go Organic Africa opened the first-ever “Rabbit Joint” in Kabale-town. Twinamatsiko hopes to prove that rabbit meat can be just as delicious as pork, or goat joints, which are more common in the area. Weekly, he purchases rabbits from farmers participating in the project, helping them to generate additional household income. There are now more than 300 rabbits at the center, including Californian, New Zealand, and Flemish Giant, which are typically bred for meat. Through KIHEFO’s development programing, poor households receive three animals (two does and one buck) and training, which enables them to start their own projects. To date, more than 100 farmers have begun breeding rabbits in their backyards. 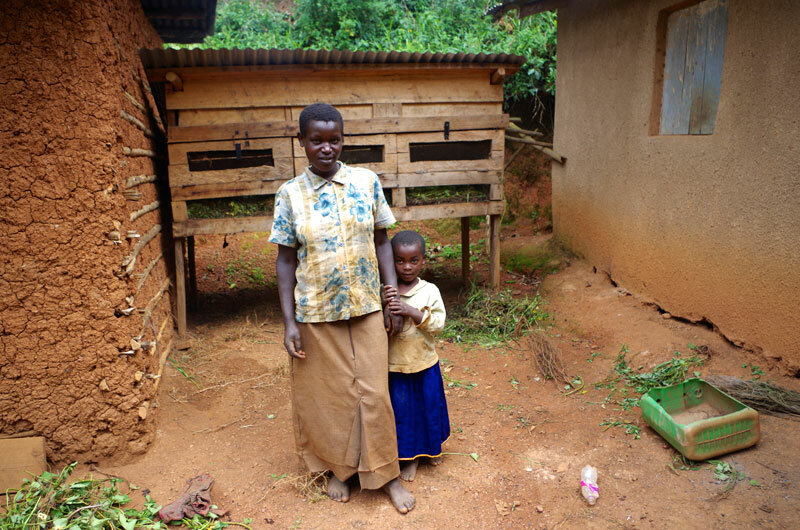 Emily Ninsiima, 28 years old, is a small-scale farmer who lives in the village of Kicumbi. She’s a single mother to two young daughters. In 2014, she received support from Twinamatsiko and KIHEFO to raise rabbits. Emily Ninsiima received rabbits and training from Twinamatsiko and KIHEFO’s rabbit breeding project that aims to alleviate child malnutrition. She says there’s little risk to raising rabbits. Starting with only one male and two females, Ninsiima’s population has quickly expanded. Her family’s meat intake has tripled over the past year. “It’s made a big difference,” says Ninsiima, whose rabbit population grew quickly. Over the course of a year, she tripled her family’s meat intake. She sold five of the rabbits, generating additional income and gave away a few to her neighbors so they could start their own projects. “It’s doesn’t take much time to feed and care for them,” explains Ninsiima, “and the risk of failure is low.” She also points out that rabbits produce a large amount of manure, which she processes into organic compost and fertilizer for her field crops. Today Twinamatsiko isn’t only training farmers how to raise rabbits – he’s building new markets and buying back the surplus at a guaranteed price. A few months ago, he opened the first “Rabbit Joint” (restaurant) in Kabale town, serving a signature dish of roasted rabbit, cabbage coleslaw, and steamed plantain. He admits that it’s been challenging to convince the public that rabbit meat can be just as tasty and desirable as other more preferred meats, like goat and pork. But working to change the cultural palate is all part of Twinamatsiko’s greater task to support sustainable solutions to child malnutrition, food security and economic development in Uganda. “As a farmer, you have to be creative. You have to be innovative,” he says.